Megan Nash keeps busy. It seems she's always got some sort of new project on the go. Whether it's writing new songs, taking part in photo shoots, recording albums, endlessly touring or preparing for world class festivals, there never seems to be a shortage of action in her life. In fact, she did all of these things in 2017, while also planning a wedding. Her third, full-length solo LP, Seeker, was released in September of 2017 and was given SaskMusic's highly coveted Album of the Year Award; it contained immediate Sask classics like "Salted Salamanders", "Wait" and "Bad Poetry", which was turned into a fantastic music video. Megan does a lot of things. But there is one thing she doesn't do. She doesn't taker her responsibility as an artist lightly. She wants the world to witness her product, and she works, incessantly, to make that happen. She's fashioned a voice that millions of songwriters around the world would kill for, she's got impeccable songwriting chops that have taken years of hard work to master, she's got class and she's got the kind of charisma necessary to make it in this industry. This is why Megan Nash gets the gigs that so many other local artists strive for. 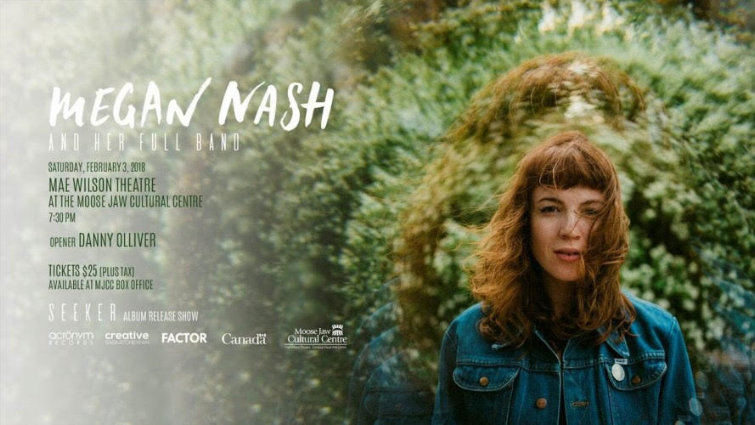 She's recently been invited to represent Canada at Focus Wales 2018, but before she heads overseas, she is booked to play an official album release at The Mae Wilson Theatre on February the 3rd. We spoke with Megan about life, AC/DC and summer camp for adults. What's going on with Megan Nash lately? I see that you toured parts of Europe. In 2017, I started to tour internationally. I played a festival in the US and played in four different countries overseas (Germany, Luxembourg, Austria and the Czech Republic), It was a great experience and something that I will continue to do in 2018. Your new Album, Seeker, is quite a bit different from your previous album Harvest Songs. It's got a solid rock vibe to it. What inspired that? I listened to Jenny Lewis’s record Voyager on repeat for a summer, I started collaborating with Bears in Hazenmore and my fave band when I was 13 was AC/DC. Probably all these things influenced me. How did you meet Bears in Hazenmore and how did you come around to working with them? Bears in Hazenmore put on a summer camp and they have a guest artist every year. In 2016 I was their guest artist. They arranged a few of my songs and I really dug it. Within a year we had toured together and recorded a full length record. It was a whirlwind. The video for "Bad Poetry" looks like it involved quite a lot of work and production, what was it like creating it? For the "Bad Poetry" video I worked with a video production company called Crushed Rockets out of Regina. I remember showing up to set and was amazed by all the extras and the decorations. Crushed Rockets did a lot of work on the video and are very cool folks to work with. The actors put in long hours and did an amazing job. Let's try something fun, recommend 3 things: a book, an album and a movie. Book: I have been super into the Outlander book series lately. I also read the Seven Husbands of Evelyn Hugo, by Taylor Jenkins Reid, on a flight and really enjoyed it.